From 65 to 150 thousand people took part in prayer for Ukraine and for its single local church. This was written by the Press Secretary of the Ukrainian Orthodox Church of Kyiv Patriarchate, Evstratiy Zorya on Facebook. He recalled that in his speech after the moleben on the Volodymyr hill, Patriarch Filaret called the event "The largest religious procession in the history of Ukraine." 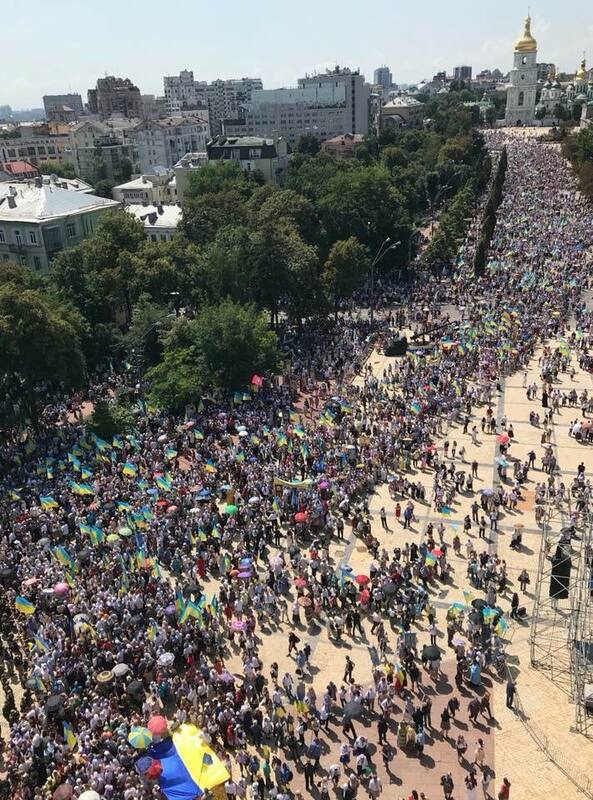 "According to various estimates, 65 to 150 thousand people gathered in the center of Kyiv, or even more believers - it was difficult to count the human sea. Until then, so many patriotic citizens who pray for the victory of truth and peace in Ukraine gathered only on Maydan during the Revolution of Dignity, "wrote Evstratiy Zorya. We recall that the festive events dedicated to the 1030th anniversary of the baptism of Rus-Ukraine, are held in 2018 in accordance with the presidential decree of August 8, 2017. In addition to the processions and solemn molebens, a number of other festive events are taking place in the capital. Let's note, yesterday, on July, 27th, the Religious procession of the UOC took place, during which eight world shrines were brought to Kyiv. It is the relics of the Holy Equal-to-the-Apostles Prince Vladimir, the head of the holy martyr Clement, Bishop of Rome, the footstep of the Apostle Andrew, the icon of the Apostle Andrew the First-Called with a part of his relics and cross on which he was crucified, the icon "Zimnenskaya", the relics of the Great Martyr George the Victorious, an icon with a part of the relics of St. Seraphim of Sarov. According to the estimates of the Ukrainian Orthodox Church, about 250 thousand people took part in the religious procession of the UOC. The autocephalous church is one of the backbones of Ukraine’s national security, as Petro Poroshenko, the President of Ukraine, said in his speech in Ternopil region, broadcasted by 112 Ukraine. “The autocephaly is not a concern of just Ukrainian orthodox Christians. It is a question of our Ukrainian independence. It is one of the backbones of the Ukrainian state, Ukrainian nation, Ukrainian national security. And, finally, of the entire world’s geopolitics,” he noted. According to the head of the state, because of this, the idea of the autocephaly is not supported by Moscow and its fifth column inside Ukraine. “Counterwork is large-scale and systematic. There are no reasons to think that we got the tomos. We have two things to do to get it – pray and fight,” he said. At the same time, Poroshenko believes that Ukraine should have the autocephaly.